Styled with ashika pant and dowling shirt . Wears like a blouse; feels like a tee. This cap-sleeve blouse is made with a drapey crepe fabric that hangs just right and always looks polished. I agree with the review that states this top is incredibly wrinkly. By the time I got to work in the morning, the top looked like I had pulled it out of a laundry basket. The colours are great and the cut is great but I almost never wear it because of this fact. This shirt looks amazing-- for about 10 minutes. I bought black and white in store because I loved the fit and look but unfortunately they get incredibly wrinkled with even limited activity. Layering them under a cardigan or jacket even causes wrinkles! I still wear them from time to time but I was very disappointed with the quality. 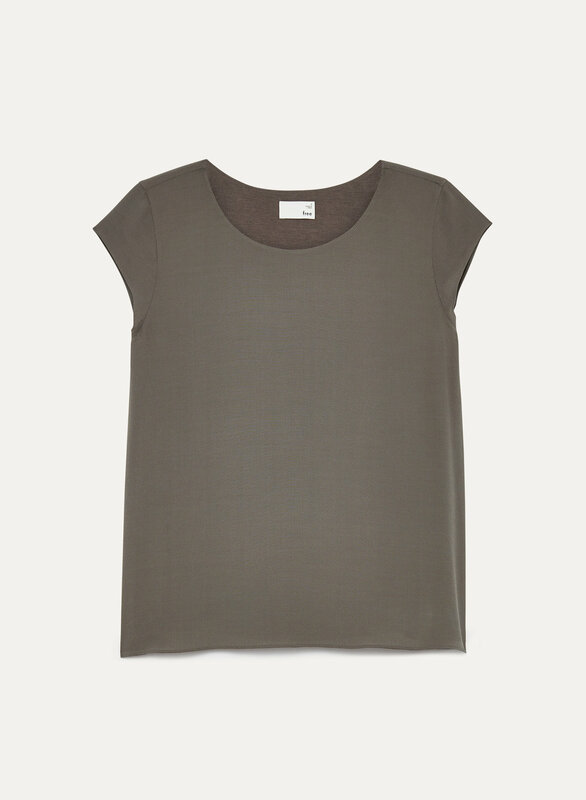 I like the cut and simplicity of this top but it is very, very wrinkly. The minute you put it on, it shows creases. You can be sitting, doing nothing and and there will be new wrinkles. It's not really a top that looks good wrinkled either. I have the white one, but maybe a darker colour would show wrinkles a bit less. Would not recommend or buy again though. I love The material. It looks great under a blazer, I bought two. Great top goes with anything. Fits well. Just did not realize I have to dry clean. The fit is swingy and very comfy! I hadn’t noticed fabric is dry clean only when purchasing. Might not have purchased had I seen it. I do like to top though. Fits perfect! You can dress this up or dress it down with a pair of jeans.